A new mobile video game called Sea Hero Quest guides players through a maze of arctic rivers, golden shores, and mystic marshes. Along the way, gamers chase magical creatures and collect starfish that they can trade in for equipment improvements. As cool as all this sounds, Sea Hero Quest isn’t all fun and games. Instead, researchers call the game “a massive online citizen science experiment” that will help them fight dementia. That’s why they’re inviting gamers from around the world to download the free game on iOS and Android devices and start playing. While gamers enjoy their mythical journeys, scientists will be keeping close tabs on the routes they take during the game. Using that data, they’ll create global “heat maps” that track how players navigate the 3D levels in the game. That information will help researchers create a baseline for how “normal” players navigate 3D environments, reports MobiHealthNews. What’s all this got to do with dementia? Researchers say that the ability to navigate 3D environments is often one of the first skills lost as people develop the condition. 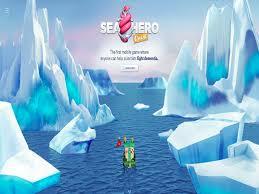 The Sea Hero Quest game was developed by Alzheimer’s Research UK, University College London (UCL), the University of East Anglia, and Glitchers, a game developer. Communications giant Deutsche Telekom is supporting the project. The scientists have a lofty end-game in mind. They’d like to use the data they collect to develop new diagnostic tests that can detect when somebody’s spatial navigation skills are failing. In the process, they hope to create a global movement to fight dementia. Sea Hero Quest offers researchers an added bonus: speed. Researchers can collect useful data from the game about 150 times faster than in lab-based experiments. Two minutes of gameplay represent 5 hours of conventional research, says Deutsche Telekom. If 100,000 people play the game for those 2 minutes, researchers can generate the equivalent of more than 50 years of lab-based research.